Every photographic enthusiasts best friend. This convenient tripod is perfect for photo and video cameras, microphones and mini speakers. It has 3-section legs which make it easy to dismantle and transport. The clever ball tilt head makes for swift and steady panning, promoting fluid movements and ensuring that none of your precious moment go un-documented! 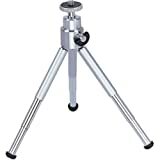 The sleek silver finish adds to the tripods mass appeal. This entry was posted in Discount Photography and tagged Camcorder, Camera, Konig, Mini, Table, Tripod by Ball Photo. Bookmark the permalink.